The library of Laika's contribution to the animated cinematic world is scattered with greatness. From the button eyes of Coraline through to the madcap world of The Boxtrolls, via ParaNorman, each of the studio's stop motion films have stood out visually from the CGI generated fare from the likes of Pixar and other contenders. 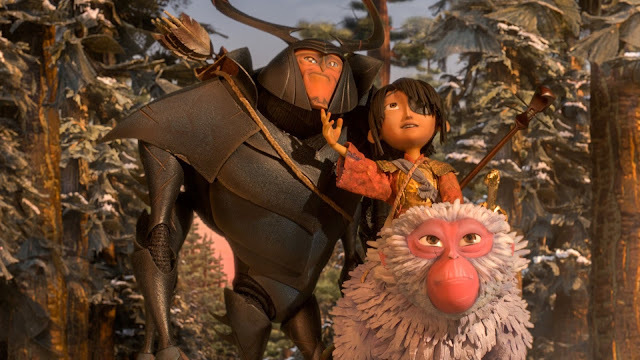 But Kubo and The Two Strings may be their greatest success yet, a story that is visually dazzling. Game of Thrones star Art Parkinson lends his vocal talents to Kubo, a one-eyed young boy who tends to his ailing mother by night, and visits the local town's market by day to earn money by telling stories. Wowing the crowds with his tales of a samurai (brought to life by the magic of paper and music), and keeping a wooden monkey protective charm close at his mother's urging, Kubo is not allowed to stay out at night. Suffusing the familial with the fantastical and blending in a great deal of emotion, Kubo and The Two Strings is a great success, even if its desire to explain and expound its themes ties it up a little in its own intricate web toward the end. Wrapping the mystical trappings of Japanese culture, this samurai quest tale is both a celebration of the art of story-telling, rendered popular by oral histories from the likes of Homer, and a complete story of its own, with Kurosawa elements fused inexorably into its DNA. While parts of the narrative take a nightmarish turn, there are questions as to whether this fable is more aimed to adults rather than children - and its desire to remind us about relatives gone and ancestors past is a noble and worthy cause that leads to a emotionally powerful conclusion. 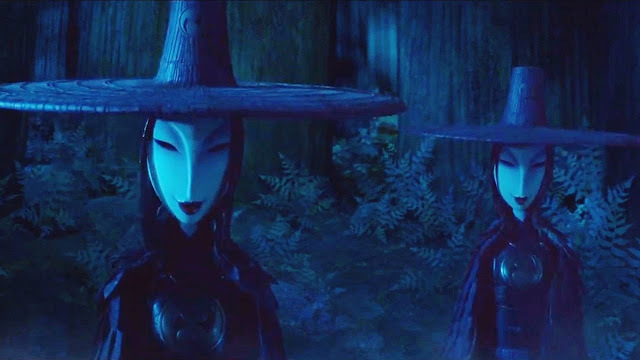 And yet, despite its perfection in stop-motion execution, there are moments within Kubo and The Two Strings which feel flawed narratively. A confused outpouring of the story initially fuses the film with muddled moments and leave the epic quest slightly floundering as you try to work out some of the darker story elements and familial conflict. And the arrival of Matthew McConaughey's Beetle sees the film flounder into more comedy than perhaps is welcome given the darker tones of what has progressed (Though perhaps that's cos it's aiming toward the kiddies). Despite that, Laika's eye for stop-motion and the seamless crafting of the Eastern elements more than make up for any short-comings that are present in this wondrous tale. (And don't even stop to consider that once again Laika has an obsession with eyes in this latest). 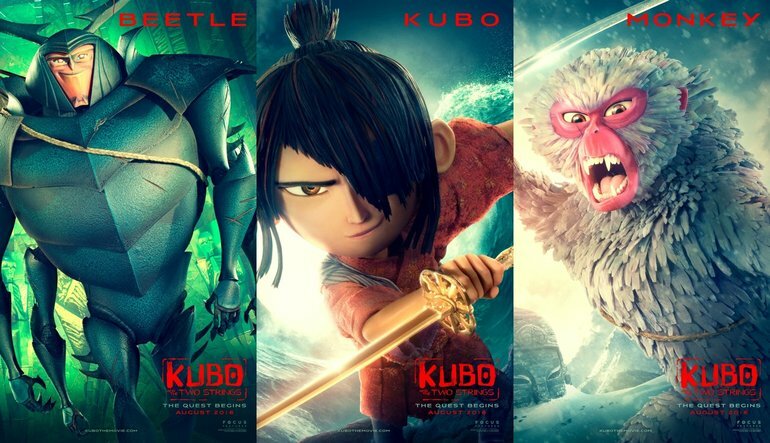 The originality of the mix of the Japanese fables and mythology, along with an Asian influenced OST, are what carries this film and the visual execution of these elements see Laika soar - and despite the feeling that honing some of the narrative elements for more clarity, Kubo and The Two Strings is easily a contender for one of the films of the year. It's a sure sign this studio Laika is achieving greatness and is only about to unleash more on the world - and that is no bad thing whatsoever. The film starts by uttering the words "If you must blink, do it now". You'd be wise to heed that warning, because once it begins, you won't be able to tear your eyes away from a second of it.